Supply Chain complexity, outsourcing, and the complexity and speed of business processes, enhance the need for real-time visibility across the chain. This makes companies like Acsis an indispensable component of your systems portfolio. We at ChainLink Research, as well as others in the supply chain media, have written and discussed the need for supply chain visibility. As business has evolved over the years, that need has increased. Outsourcing, globalization, risk, the complexity of business processes and products, and the need for speed, have driven firms to demand more information from their trading partners. Partners are no longer content with phone calls, emails and faxes; they want to see the data, now. Let's take a quick walk through history (Figure 1) and see how business and the need for visibility have changed. 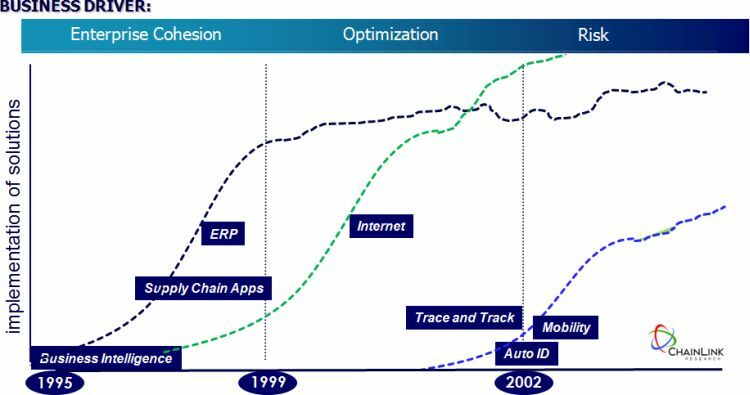 In the late 90s, we saw huge innovations in software to support re-engineering, globalization (Euro conversion seems so far away, now) and Y2K. CEOs complained that they had poor visibility into their enterprise financials and sales. ERP rode that wave to the top. But ERP was insufficient to manage complex supply chains. So, supply chain companies also thrived, with Advance Planning and Logistics solutions for the warehouse. Together, ERP and Supply Chain solutions supported the 'enterprise cohesion' needs of an organization. Then, right on the heels of ERP, came outsourcing and the internet. Firms felt the need to 'de-assetize' their books, optimize and reduce costs, and outsource plant, people and inventory. (ROI, ROA and free cash flow are wonderful things to the stock market!) Transaction management on the internet flourished as the primary means to pass signals between outsourcing trading partners. It gave both partners visibility to track transactions such as purchases and payments, etc. There are real concerns about risk, both operational and strategic, and they drive the need for more visibility. And internal-applications only, packaged software like ERP, WMS, can't perform that function. Thus there is a great need for solutions that integrate the streams of business events, states and statuses, and make them visible across functions and across multiple enterprises. So how does Acsis fit into all this? In their early days, Acsis software tracked the minute activities in the factory and warehouse. As they evolved, they have provided the data, monitoring, controlling, and analyzing for enterprise cohesion. That foundation has allowed them to provide a unique capability as we moved to the virtual world. And Acsis embraced the web, Auto-ID and architected solutions for the current risk-laden era. Many firms are touting visibility solutions. They are passing EPCs (Electronic Product Codes) across the internet. And at some level, doing that can work. But that does not provide any insight into answering the above questions, especially, "Are things actually happening according to plan? Was something changed, diverted, or delayed?" Acsis has introduced their VisiTrack solution which provides the rich context from operations data, as well as inter-enterprise traceability. Unlike some solutions that can track a package, this capability has allowed them to provide insights, analytics and decision making at all levels of the business. At DuPont, 550 sites are using the Acsis VisiTrack solution. Coke has 23 sites across 8 countries. And the list goes on. High speed and high risk supply chains such as Pharma, Food, Chemicals, and Aerospace and Defense become the number one users for these solutions. Acsis plays in these markets.